Strathalbyn, Drive 5 kms. Turn left at Jaensch Road. Drive over the ford and onto the "No Through Road." Follow the electricity poles right to the end (3.5 kms) At the last pole drive a little further and on the right is Broken Gum Retreat. From Strathalbyn: Take the Strathalbyn/Callington Road. (South Terrace) Turn right at Woodchester. Drive 7 kms. Turn right onto Jaensch Road and onto "No through road". Follow the electricity poles right to the end (3.5 kms) drive a little further and on the right is Broken Gum Retreat. Whether you’re looking for time out to recuperate, a family holiday or just getting away from the hum drum of city life, Broken Gum is the place for you! Nestled in country South Australia, just 50 minutes east of the Adelaide CBD, lies a unique bed and breakfast country retreat called ‘Broken Gum’. The property accommodation lies in the centre of three regions, namely Adelaide Hills, Fleurieu Peninsula and Murray Lands. 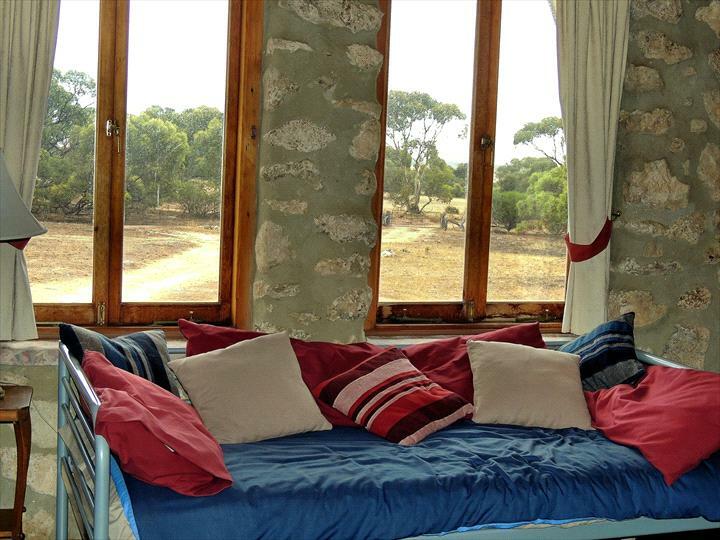 On 150 acres of rolling tree studded countryside, is our beautiful 3 bedroom, limestone and recycled timber loft homestead, which is a fully self contained bed and breakfast with stand alone solar power and rainwater. The open plan downstairs kitchen, dining and relaxation area, boasts a slow combustion plus wood stove, great for cooking delicious meals in winter and providing piping hot water. The LP gas stove is good for cooking during the summer months. The upstairs open area is a beautiful place for relaxing and has spectacular views. Individuals, couples, groups and families love this property. Kids delight in collecting eggs from free range chickens. A favourite pastime is spotting kangaroos, sheep, lambs and a variety of lizards, ranging from the tiny painted gecko to the larger goanna plus abundant birdlife ranging from the tiny spotted finch and blue wren right through to the majestic wedge tailed eagle. The camp fire setting is perfect for sharing stories, toasting marshmallows and star gazing on still clear nights. 20 acres of virgin scrub houses some of the rarest native orchids and wildflowers in the region and is a delight to wildflower enthusiasts during springtime. Kangaroos can often be seen bouncing through this delightful area. This property houses South Australia’s first Carbon Neutral Canopy Project of 14,000 eucalyptus, acacia, melaleuca and other native species. There are stunning panoramic views of Mount Barker and Lake Alexandrina, plus breath-taking sunrises, sunsets and moon rises. Whether going on a family adventure around the property, a picnic in the top paddock or a short leisurely stroll up the hill where wild daisies in season display a magic carpet of yellow, you will love the experience of just getting back to nature. And yes, we are dog friendly. For a change of pace, DVD player, a collection of DVDs and CDs, TV, iPod dock and radio plus internet access is available. All in all, a unique and restful holiday accommodation awaits you! Three bedroom homestead with full kitchen facilities, laundry, 2 lounge areas and plenty of room to move. Bed 1 has a queen bed. Bed 2 has one single and 1 bunk. Bed three has one single and there are two sofa beds available. Families are most welcome. Your stay includes full breakfast provisions, firewood and access to 150 acres of bush walking. Cancellations greater than seven days will incur an 20% cancellation fee. Cancellations less than seven days incur a 50% cancellation fee.